But do they serve coffee? Remember Isidoro, the man with the chocolate factory, that I wrote about in May 2018? 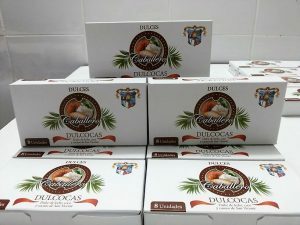 At the time of writing, he was looking to raise funds so he could register his products with Invima, Colombia’s food and drug regulatory agency. Isidoro in his old store. 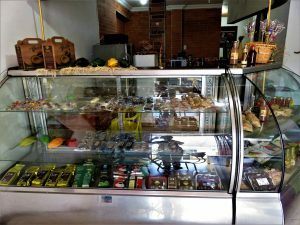 The first piece of good news is that Isidoro is now in the process of registering one line of business, the one that produces chocolates and candies. He thinks that once he is is able to increase the distribution of these products, he will raise sufficient funds to register the second line, the chocolate used for hot chocolate. The front of the new store, looking in. The second piece of good news, is that Isidoro and his new partner opened a new store in a high traffic area. 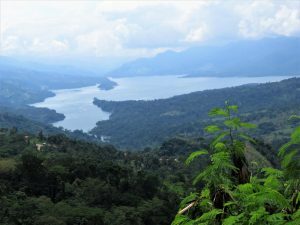 The new store is located about an hour from Bucaramanga and overlooks the reservoir created by Sogamosa Dam. The view is beautiful. View from Isidoro’s new store. I was there a week after it opened, so much of the potential of the new location is yet to be realized. At that moment, one could only purchase chocolate products and beverages. Customers making decisions on what to purchase. While others relax and enjoy the view. This location has lots of potential for menu expansion as well as for other services, according to Isidoro’s partner. We wish them success!! This is a “special interest” blog as Isidoro is not a CAPD project. He is, however, a friend who warms our hearts with his accomplishments. I had not really internalized the scope of the tragedy that occurred during the night in November 1985, when the volcano Nevada del Ruiz erupted and caused massive and fast-moving mud slides into 6 drainage areas. The best known of these was the tragedy that befell the municipality of Armero, Tolima, Colombia where 25,000 of the 40,000 inhabitants perished in a few hours. Those who were not buried suffered from acid burns since the mud mixture contained high amounts of sulphur. 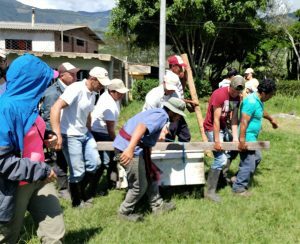 https://en.wikipedia.org/wiki/Armero_tragedy. Monument to those who lost their lives. Note the grave marker to the right of Bob’s foot. This monument gives one a sense of what lies below. The mud zone has reverted to bush over the years, but the bush is littered with grave markers where families died. What was once the 4rth floor, has become the first floor. The building you see in the photo was actually the 4th floor of the hospital. This rock was moved 14 km. 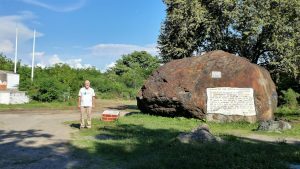 This rock had been a well-known fixture in a stream 14 km upstream from where it landed. 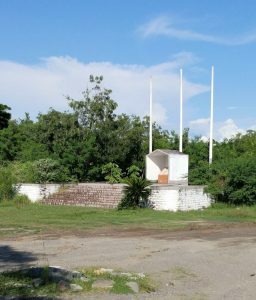 This monument is where the police station stood and where 35 police died. 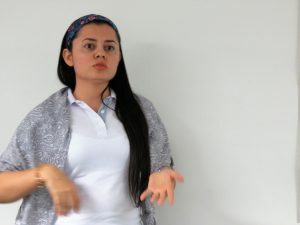 While there were warning signs that the volcano was about to erupt, there was a simultaneous distraction occurring in Bogota which paralyzed the national government. This Bogota event was the takeover of the Supreme Court (Palacio de Justicia) by the armed group M-19. 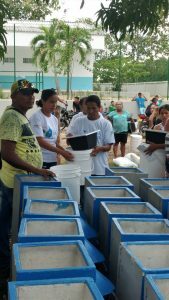 The outpouring of foreign assistance to help Armero survivors was truly impressive and components of that assistance still are in evidence in the region today. 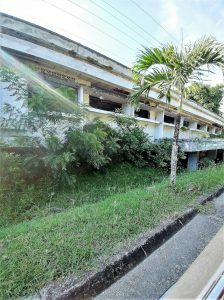 Many survivors ended up in a neighbouring town called Armero Guayabal but the tragedy lives on in their hearts and continues to shape the tourism industry in the region. In November, I toured communities where the Green Light (GL) education assistance program is active. Frankly, I was blown away by the enthusiasm of parents and their projects. This blog presents highlights. 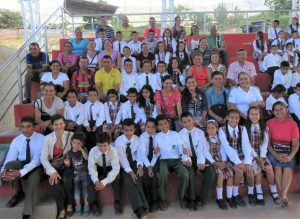 Parent group in la Purnia school. 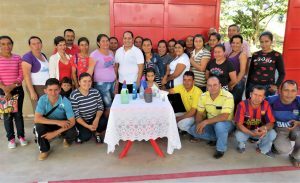 The parents in the photo above are pretty enthusiastic about their project to raise money for school improvement projects such as a library, a garden of flowering plants and trees, and recycling. 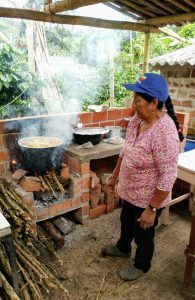 First, they planted corn, some of which they sold, and from the remainder they made a typical corn-based snack for sale. They used those funds to establish a library with internet and to plant flowers around their new school. Their current project is to make and sell cleaning products. 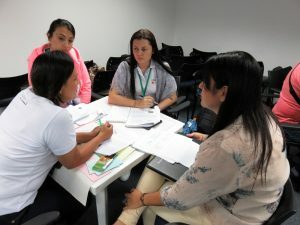 Several women took a course in SENA, Colombia’s technical institute, to learn the process. They had just begun to open for business when this photo was taken. They make cleaning supplies for the kitchen, bathroom, floors, dishes etc. These types of projects are flourishing in the 17 communities in which the GL program is active. Each community decides on how to raise the funds required to establish a community library, plant school gardens, and encourage recycling. Students in the GL program with their parents. Students thank CAPD and Canadians for the assistance received through the GL program. Parent group in the Wayuu community of San Jose. What are they holding in their hands? Articles made from recycled material! 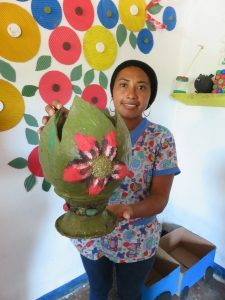 A facilitator holds a large decorative item made from recycled material. 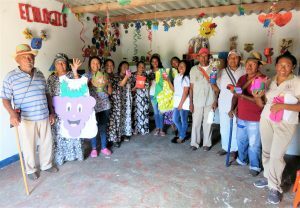 The San Jose community constructed a library in which they engage preschool and primary students in the elaboration of decorative items made from recycled materials. These activities raise consciousness in the children and encourage creativity. But that’s not all! They also cultivate crops for sale such as hay and are building a kid’s park made of recycled tires. 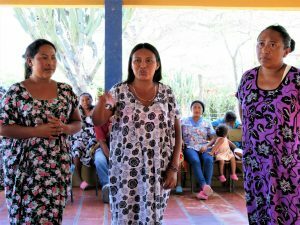 Mothers speak about the importance of the GL program in the lives of their children. 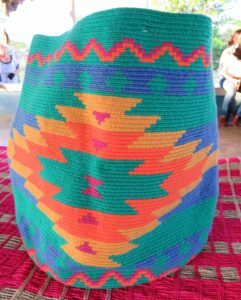 This traditional shoulder bag called a “mochila” was made by women in the Jurimakal community. 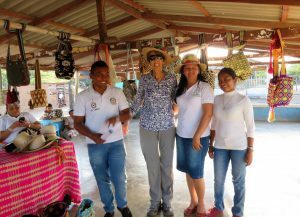 Other Wayuu communities make and sell these traditional bags, called mochilas, to earn funds for their community projects. These are beautifully hand-crafted bags that resist the wear and tear of daily use. A bit of fun – posing with the hats gifted by the community. 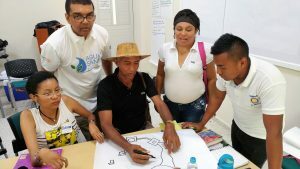 Luis, left, is the facilitator for the community of Jurimakal. Miladis, facilitator of the community of Pinski, is on the right. Beside her is Rocio, the National Coordinator of the GL program and the creative vision behind these projects. The objective of the GL program is to keep students in school until graduation. Their incentive is a uniform kit that includes shoes and school supplies. In order to stay in the program, they are required to maintain a 75% average mark and their parents must be involved in the program. Each school has a facilitator, a volunteer from the community, that engages the families. They are the backbone success of the program. There are 820 children in the program this year. 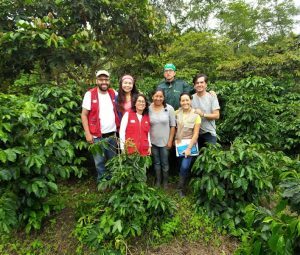 The state of Nariño is famous for its coffee and it was in this coffee growing environment where CAPD recently co-sponsored a filter construction workshop. 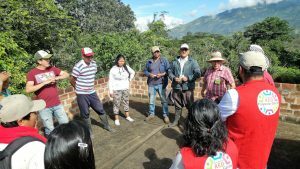 The Fundacion Suyusama, co-sponsor, has been working for decades in rural areas near Pasto, to improve the lives and productivity of rural folk, through efficient wood stoves, drip irrigation, water system infrastructure, improved seeds, agricultural extension in all its facets, etc. Ivan Castro, our partner in FRPG, worked for Suyusame earlier on in his career and he was responsible for brining us together. 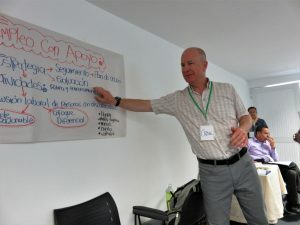 Previously a couple of Suyusama people attended the construction workshop in Pasto (previous blog) and it was good to have them involved again. Bob did not appreciate the significant logistics challenges of having a filter construction workshop out in the countryside but Ivan and his friends in Suyusame made it happen. 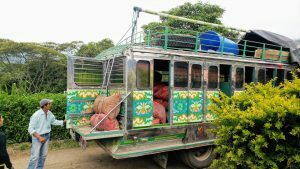 In the photo below, you will see a “chiva” which carries cargo and passengers on a daily route. Without this service it would be very difficult to bring in supplies or send the harvest to markets. The chivas all have loud air horns and you can hear them coming from a distance starting at 6 am, so you can get to the road to flag them down. They are reliable but not comfortable nor fast. This is the rainy season in Colombia and it had an impact on the training. We fortunately found a partially finished house, and mixed concrete and filled the molds inside the house and on the porch. Next morning the house was being used by a group of women preparing a lunch for a meeting in the adjacent church hall. 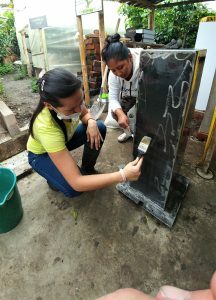 Our group rose to the occasion and moved the three 350-pound concrete and steel molds to a less crowded workspace by suspending it from a bamboo pole (see photo). Do not be fooled by the sun in the photos. Bob continually wished for rubber boots to complement his rain jacket but sadly had to put up with wet feet for 2 days. A welcome spot of sun with fantastic scenery. 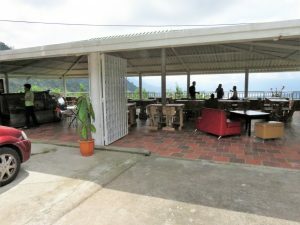 In this and other pictures you will see coffee bushes and the long slopes of the Volcano Galeras. The group learned some theory, constructed 3 filter boxes as part of the workshop and learned how to install the filter media. Bob was mighty impressed with the group of 14 men and women. Everyone jumped into action as soon as the word was given. Without this proactive attitude the workshop would have been impossible. These men and women now know what is possible when considering improvement of water in the homes near where they play roles as servant leaders. Strangely enough, Bob did not get a coffee until he asked for it. You may recognize this picture of Tatiana from last year. We saw her, sitting on the ground, when we were delivering a stroller to a neighboring child. Tatiana was 12 years old in that picture and had never been to school. She also hadn’t had the medical care she deserved due to family complications. 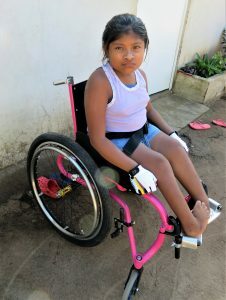 This year, it was her turn to receive a wheelchair. Whereas Tatiana didn’t say “boo” last year, this year she admitted that she would like to attend school. Let’s hope that it becomes a reality for her. 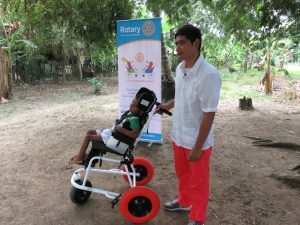 Our partner in the wheelchair program in la Guajira is the Rotary Club Cerrejon. They will provide follow-up. 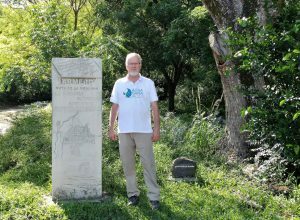 Josue poses with John, design engineer, in the grounds of his home. Meet Josue, one of two children from the same family born with cerebral palsy. Besides his physical limitations, Josue also has limited sight and sees only shadows. 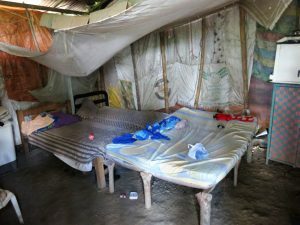 Josue’s family has been displaced twice by the internal violence of Colombia. That means that TWICE the family lost all they possessed and had to start over again in another location. Can you imagine? At the moment, they are living in a very humble house as they try to get back on their feet. The picture below is of their bedroom. Note the walls made of cloth bags used for corn and the dirt floor. This is the family’s bedroom. I could be telling you a very tragic, no-hope sort of story, but that is not the case. This family has something special that is shared between them and that is love. It is so clearly manifested that it warmed my heart. I think they are a very special family. 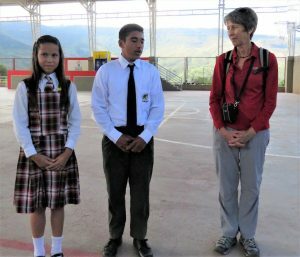 The Rotary Club Ronda de Sinu is in agreement and will help them acquire a permanent home. 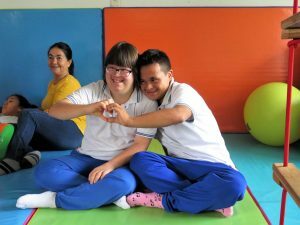 This club is our partner for the custom wheelchair program in Monteria. They provide follow-up and we (CAPD & ASODISPIE) provide annual maintenance of chairs previously provided. Foam lining of a rather peculiar but effective chair seat. John, the design engineer posing with Josue in the picture above, has a creative mind and loves to invent. And this is what he designed for Shirley, a child with a condition that leaves her bones vulnerable to multiple fractures. In her short life, Shirley has had 17 fractures. So, John devised a chair that would fit her body and protect her from further damage at the same time. 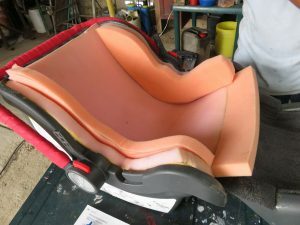 It is a modified baby seat. Shirley occupies her throne like a princess. Shirley and her parents are very happy with the outcome of this new design. We hope it provides her and them with greater independence and security from further harm. John and I made the rounds to Albania (la Guajira), then Monteria (Cordoba) and finally to Piedecuesta (Santander), providing new chairs, reviewing old ones, plus evaluating new children for the Program. In all, we made 31 visits to children living in rural and semi-urban areas. 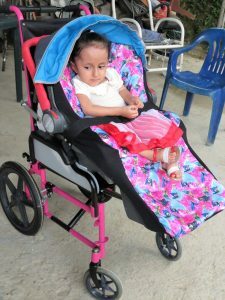 CAPD partners with ASODISPIE to construct these custom wheelchairs. CAPD shares the cost with our respective Rotary partners, in addition to ASODISPIE who held a fund-raising campaign for two children from Santander. Thank you to all our partners and donors for this Program. The children and their parents thank you. FANDIC celebrated its 20th birthday this year!! They marked the occasion with a special celebration for the volunteers and families, those who formed part of the family over the years. Marlene, as the founder of FANDIC, provided an introductory welcome. Each family received a certificate of participation; the children danced and the mariachi band played. A good time was had by all. Twenty years – it is hard to fathom that this fragile seed planted in a community rife with problems, could have flourished and continues to strengthen. 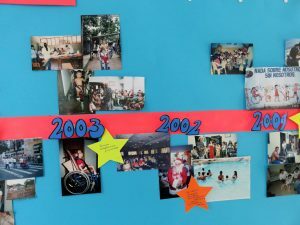 Fandic’s timeline, composed of pictures, helped us recall special moments. 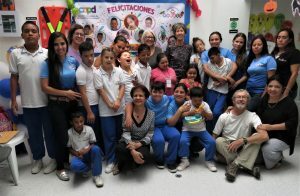 This year, Fandic was chosen to represent the category of organizations working with children, for a campaign run by Vanguardia Liberal (a local newspaper) called “Bucaramanga without limits”. The organization with the most votes is provided with funds to improve their infrastructure. The photographers came and the families responded. Forming a heart, a symbol of the campaign. FANDIC was still in a celebratory mood when this picture was taken. There are 4 foreigners in this picture. Can you spot them? Good friends, Dan and Vio, came from Manitoba to visit, and Beatriz came from Madrid to volunteer for a month. Thanks for helping us celebrate! Thank you to all FANDIC leaders and families for their participation over the years. You are the heart of this organization. The month of October for Bob was a takeoff on “Around the World in 80 days”. Over the course of the month, via buses and cars and planes, he managed to visit groups in 6 different states. Never to be repeated, he says. Each group was planning or executing a project to help their neighbours. Of course, most of the projects were water filter related. CAPD, as mentioned over the years, is involved in participatory development, so we go where we know people and we see enthusiasm and commitment, and these groups have demonstrated this. 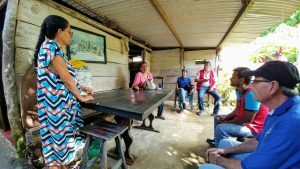 With the improvement in security, city dwellers are increasingly reaching out to help rural families, whether the program involves water, education, health or economic activity. 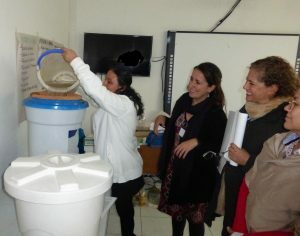 CAPD has provided molds and training in various related themes to each of the groups involved in water filter projects. 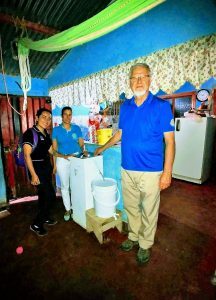 Bob is increasingly impressed with the commitment that Rotarians are showing in helping rural folk get safe water for drinking and cooking. These projects require a range of skills from administration, accounting, logistics, training, community relations, etc. and require hands on involvement at least a couple times a week and sometimes require flexibility to take time during the week. Bob would like to acknowledge the volunteer service of Rotarians in Fonseca, Santa Marta, Barranquilla, , Montería, Ibagué and Bucaramanga. The photos below show some of the volunteers in action. 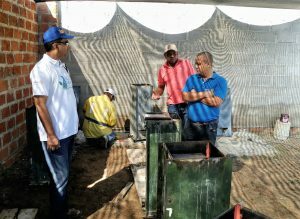 Rotarian Harold Bonilla (white) and Rotarian Carlos (blue) inspecting the filter construction area. 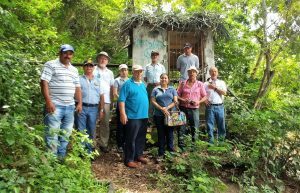 Rotarians from Santa Marta chatting with some community leaders about the filters recently installed in the community. 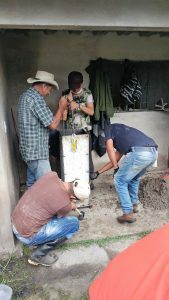 Rotarians from Santa Marta visiting a home which received a filter 4 months prior. Rotarians from Santa Marta on a Friday, pausing in the street of a village where filters were recently installed. 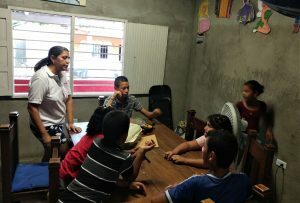 Volunteers from a Colombian foundation in the community of Oasis (Santa Marta) provide after school activities for children in a squatter’s community. 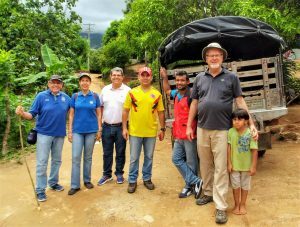 Rotarians delivering filters to a community near Monteria. 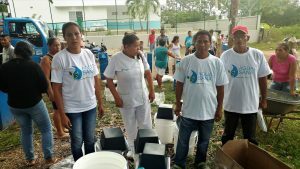 Community volunteers have received Tee shirts with the program name and logo and showed great dedication in making sure people got all the filter components to take to their homes. 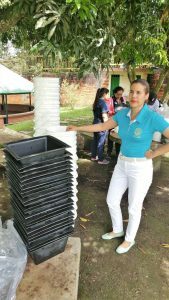 In Ibague, Rotarian Maria Clara takes time off during the week to organize materials for a shipment to a village. 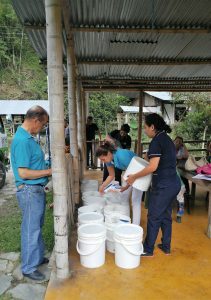 Near Ibague, Rotarians (turquoise) prepare to hand out filter components. They do have jobs but are able to take time off. 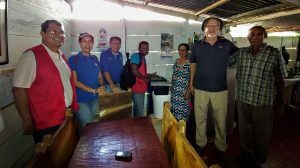 Bob, Rotarian Maria Clara and Program Coordinator visit a home to see how the family is doing with the filter. 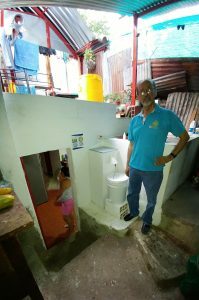 Rotarian Mario, program director in Ibague, visits a family with a filter. 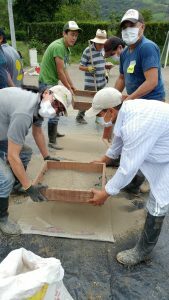 Rotarians from Nuevo Ibague and Armero Ibague were invited to help this community solve their water problems. On a weekday, we spent two hours on the highway and an hour bumping along a rough gravel road, just to arrive. 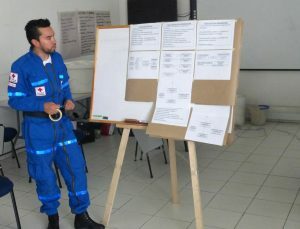 The last 3 weeks in April have seemed a life-time especially for the facilitators carrying the training responsibilities. 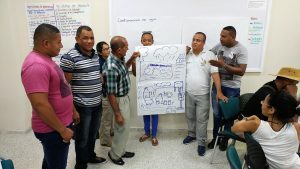 Each of our 3 organizations contributed to making 4 successive training sessions in 3 cities a success – Eva Manzano of CAWST, Bob from CAPD, and Ivan and Rocio from FRPG. We are extremely grateful to Eva for her energy, creativity, experience and leadership that kept us all going through this grueling time. Small group discussion on water quality issues. 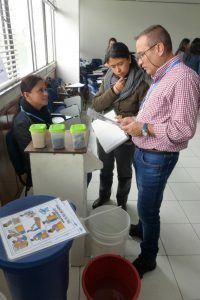 We started in Cartago on a Thursday and Friday with a varied group of people interested in Household Water Treatment Systems (HWTS). They ranged from students, to engineering managers, to people involved in community water supplies where no treatment plants exist. The goal was to educate the group on a multi-barrier approach in order to have safe water – which may not meet potability standards but is safe enough to not cause disease. They were a good group and actively participated. Friday night we packed up, and Ivan and Rocio drove 8-10 hours back to Bogota with all the equipment, because Monday morning we started again. They reviewed advantages and disadvantages of each filter type. They poured dirty water through filters. 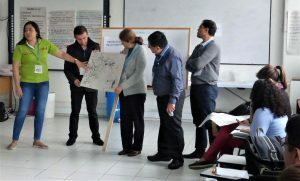 Starting Monday, the first Bogota 3-day training covered much of the same material as in Cartago but with a bigger group of civil servants from the ministries of housing and health. Ivan and Rocio hardly got any rest and had the filters and other educational toys set up by the time Eva and I arrived. The additional day allowed representatives of the Ministry of Housing to talk about the alternative regulations that will govern appliances (filters) used in HWTS. 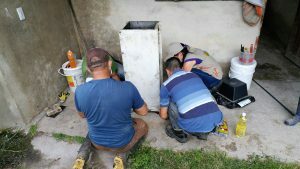 Colombia is a leader in this concept of ensuring that appliances installed in rural homes meet some kind of standard. This is an exciting prospect to help rural families get safe water. These new regulations have generated controversy since there are factions within the various levels of government who want more formal and rigid control of water quality. Small groups are given thought-provoking exercise to encourage problem solving with real-life challenges. They presented their solutions to a practical problem. 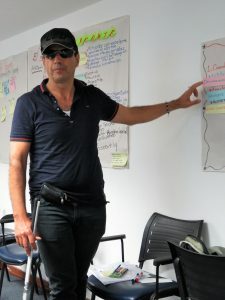 The workshop helped many see the challenge of helping people have a better quality of life in a very practical fashion, without giving up some of their oversight responsibilities. We also had a representative of the Ministry of Health to present a hygiene education program that they are implementing. This program theme will dovetail nicely with HWTS to reduce incidence of diarrhea and parasites particularly in children. Attendees were mostly civil servants from the ministries along with a few Red Cross volunteers. They all had some reason to learn about the practicalities of multi-barrier water treatment in homes. An attendee from Red Cross presents results of small group exercise. The following Monday, we did it all again for Ministry people coming from outside of Bogota. A slightly larger group but again, prodded by Eva’s experiential-based learning activities, everyone soon got into the act. There is no nodding off in these sessions. Active demonstration of multi-barrier approach to treat water. Wednesday night we packed up rather quickly but Ivan and Rocio had “pico y placa” – a system where cars are kept off the road one day a week during peak hours if they have a license number ending in x. So, they had to wait till 7:30 pm to start heading home. But they are younger than I am, so they have more stamina! 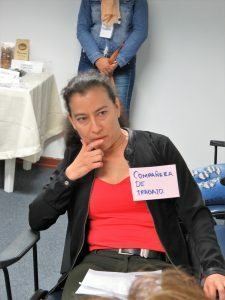 Participants in one of the Bogota workshops. One more to go. Friday morning Eva, Rocio and I got together to plan the agenda for a training of Community promoters and Rotarians. We then headed to the airport and flew to Riohacha. 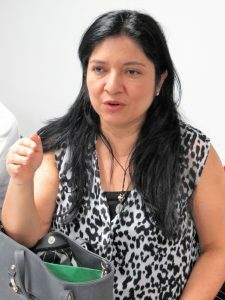 Eva needed to buy 65 mochilas for an event she is organizing and the seaside promenade in Riohacha is the place to shop for these bags, so with a large fistful of cash, she spent 90 minutes negotiating with various street merchants. Mission accomplished, our host Rotarian, Harold Bonilla, drove us in the dark for 90 minutes to Fonseca. 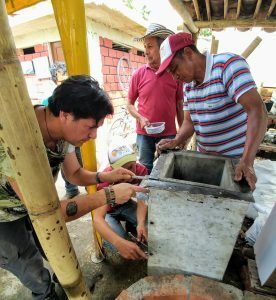 The training in Fonseca was different from the previous three since the Rotarians had limited knowledge of BioSand filters and project implementation despite recently having received financing to do a large project. Rotarian. Harold, guides small group discussion. We also had approximately 14 community volunteers from the communities who will help with logistics, education and follow up for the 750 filters about to be built and installed. First thing to go was the power, so we had no light and no air-conditioning. Thankfully a Rotarian is the head of the local university where they have a generator, so all was not lost. A varied crowd with a wide range of education but again, no sitting on your hands in Eva’s classes. After 2 days we were confident that they had a solid understanding of the multi-barrier approach to HWTS and had a better understanding of how to implement a sustainable Project. Thanks to Harold and his wife Areidis for their hospitality. A group presents their results with confidence. We had a rather interesting wrap-up where people make kind comments but one older gentleman from a rural community got up and started singing a song he had made up just then. A few minutes later he delivered another one. I think they call these people “cuenteros” (story tellers). A nice ending. 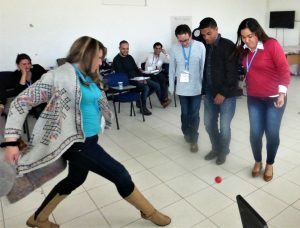 Workshop participants in Fonseca finish on a happy note. 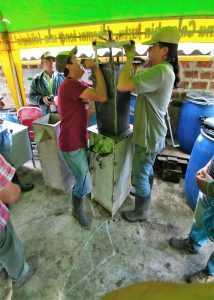 We are happy to have accomplished an incredible amount of training which will foster demand for more filters in Colombia. Leaving Fonseca was not without its challenges but that is another story. 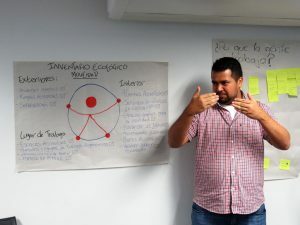 I met Isidoro during our recent workshop (see blog on employment preparation workshop). Isidoro is from San Vicente, about a 2 – 3 hours bus ride from Bucaramanga, if all goes well. The town of San Vicente has about 4000 inhabitants but there are 38,000 living in the municipality. 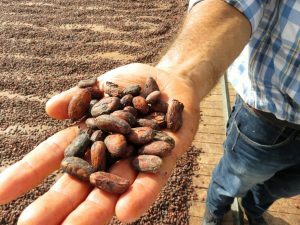 The zone is a major producer of cacao, the chocolate bean. Isidoro makes his living fixing electronic equipment. Isidoro didn’t go to school, but nevertheless is an educated man. As a child, he lived with his father in an isolated part of the municipality that was a 12-hour walk from the road. Although he didn’t attend school, a priest taught him to read the Bible. Then, at 12 years of age he was kidnapped by the guerrillas and at age 14 was injured by an explosive device and lost the use of his legs. 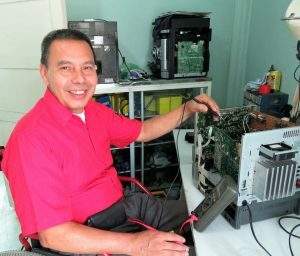 After his “rehabilitation” he taught himself electronics from which he makes his living. Isidoro poses in his store in front of his chocolate label. Twelve years ago, he got the itch to do something new, and embarked on his chocolate journey. 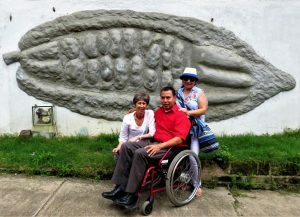 His dream is to make San Vicente a chocolate tourist destination. Olga, President of FANDIC, and I were his willing subjects on “The Chocolate Route”. Isidoro’s store where he sells his chocolate products. 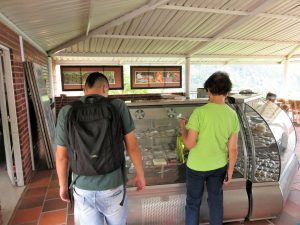 Isidoro makes 20 chocolate products and sells them in his store that he opened 2 years ago. Unfortunately he has to close the store because it isn’t self-sustainable. He uses personal funds to keep it in operation. One of the 20 products, a box of chocolates. He says that the population of San Vicente is not large enough to support the store. 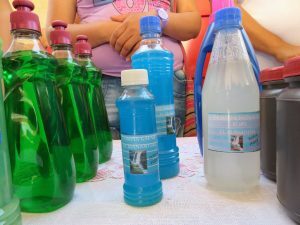 He wants to sell his products in other cities such as Bucaramanga, but to do this he has to register his three lines of production with INVINA, the regulatory agency. And this is very expensive. Olga and I pose with Isidoro in front of his factory. The emblem is of the coffee “mazorca”. 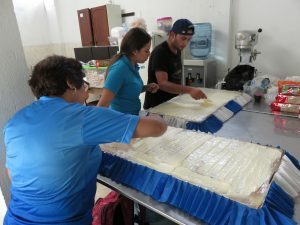 Isidoro makes 20 products including chocolate powder, with and without sweetener, and many types of caramels and chocolates, with the equipment in his factory. His factory is sustainable but to meet INVINA regulations he will have to upgrade the equipment. 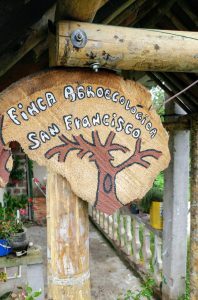 After a tour of the factory, we visited the cacao finca from which Isidoro buys his raw material. 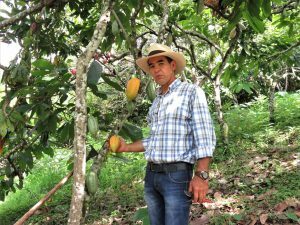 Don Ernesto, the owner of the finca, has 10,000 cacao trees in production and another 10,000 trees coming on line. 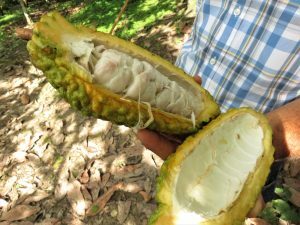 The cacao is 100% organic. He has 200 goats that produce a nutritious fertilizer and milk from which he produces a line of milk products. Don Ernesto shows us a ripe “mazorca”. He split it open to show us the beans. 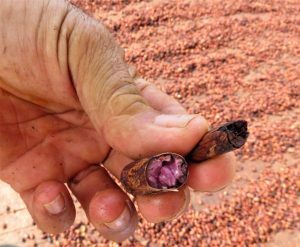 The beans, with their mucous-like covering, are easily removed. The beans are placed in a fermentation tank and turned every 7-8 hours to remove the mucous-like covering. 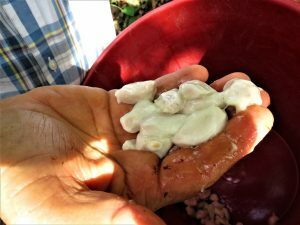 Isidoro buys the entire “marzorca” and uses the shell as a container for chocolates and the mucous covering the bean in his recipe for caramels. Cacao that has been dried in the sun for 3 days. After fermentation, the beans are spread out to dry in the sun as shown in the picture above. The bean on the left was put in the sun that day. The bean on the right has had 3 days in the sun. You can see the difference. The picture above shows us the difference between a bean that is fully dried and one that just started its process of drying. The beans in the background have just put put out to dry. You can see the difference in colour. After drying, the shell is removed and the bean is ready to be processed. A fake interview in the local community radio station. 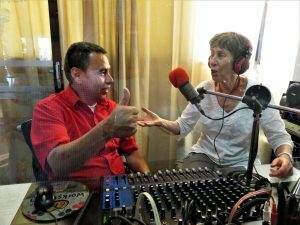 Isidoro is a founding member of this community radio station that is completing its 20th year. It is one of the few community stations that is self-sustaining. 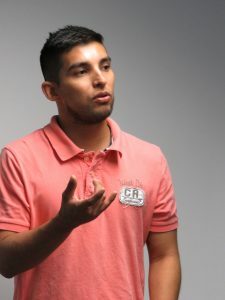 Isidoro is an entrepreneur who has founded social and business enterprises. He is a respected member of the community. 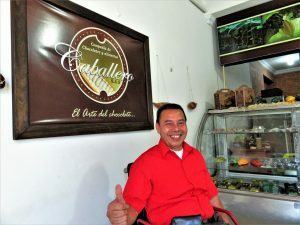 His dream is that his chocolate business provide employment for people with disability in production and sales. And I have promised to help by starting a campaign. Those of you who have experience with crowd funding please contact me. If you know of a Colombian or Canadian business person looking for an investment opportunity, please contact me. Let’s raise the roof for Isidoro Caballero! 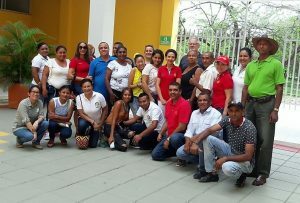 These are the happy graduates of a 36-hour workshop on employment preparation for people with disability, just completed in Bucaramanga. 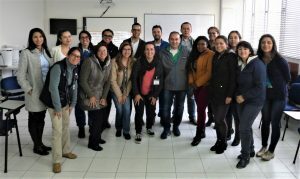 Craig Baskett, Program Administrator of the Transitional Vocational Program, Faculty of Continuing Education and Extension, Mount Royal University (MRU), led us step by step through their program of academic preparation, practical experience and support in the workplace. 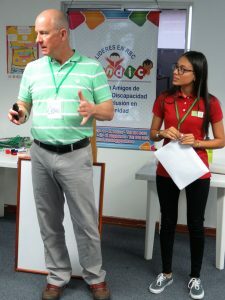 Craig explains the MRU model with the help of a translator, Leidy, a University student.. The goal was to learn about the model used in Calgary and adapt it to the local context. Employment inclusion is an important issue for people with disability. CAJASAN a national employment agency, has implemented a strategy but with limited success. Motivation to hear Craig’s presentation was high. The workshop was organized by FANDIC, CAJASAN, and the Disability Network. It was sponsored by CAPD, MRU and the Rotary Club of Calgary South. Attendees included academics from universities as well as leaders from each of the three entities listed above. A work group composed of CAJASAN employees and one academic. 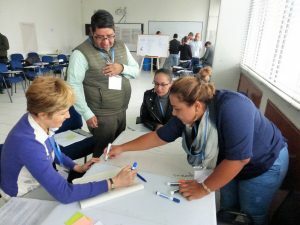 The attendees worked in groups to grapple with the adaptation of the MRU model to the local context. The knowledge and experience of each person melded together to create a new vision for inclusive employment. Monica, academic researcher, reflects on what had been said. Alberto spoke through a sign language interpreter. Alexander presents on material he is not able to see but is firmly lodged in memory. Carol from CAJASAN speaks from her experience in employment inclusion. Craig provided lots of constructive feedback. Danilo, psychologist, is keen to work in the field of inclusive employment. Olga, expresses her vision based on experience with fANDIC and the Disability Network. And we enjoyed our social time at lunch. Typical Colombian food and conversation made an excellent pairing. 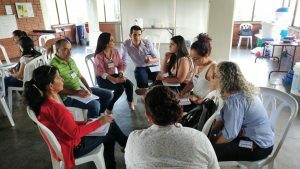 Then it was back to work until we reached the goal – The first draft of an inclusive employment strategy for Bucaramanga. 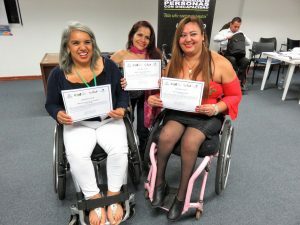 Martha (left), Maria (middle) and Adele (right) with their certificates. Craig was very pleased with the gift presented to him as was I. We were all in a jovial mood by the end. 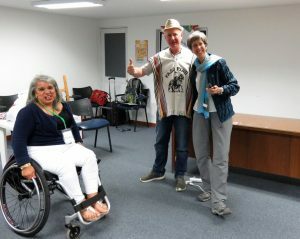 Besides the workshop, Craig had an evening lecture for the public at large and another presentation to people attending the disability network meeting. Both meetings were very well attended. We also visited two businesses that were already employing people with auditory limitations. One of these was a beauty salon, where we were given a free manicure! 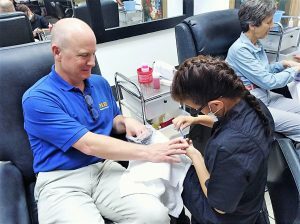 Our very competent manicurists were both women with no hearing. How did we communicate? Not a problem. Craig left somewhat exhausted but pleased with the outcome. He knew the workshop had met its goal after seeing the final presentations. The work groups were right on target! 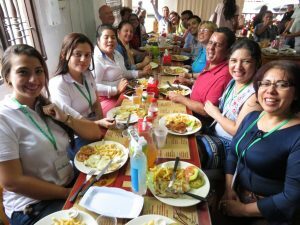 Thank you to Craig, workshop organizers, and sponsors for providing this opportunity to advance inclusive employment in Bucaramanga.